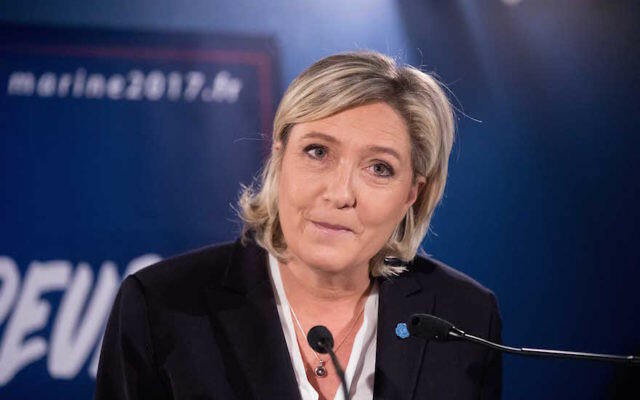 Marine Le Pen, the leader of France’s far-right National Front party, said she favored making it illegal to be a dual citizen of France and other countries outside Europe – including Israel and the United States. Le Pen, who according to some polls is the leading candidate in France’s presidential elections in May, spoke about dual French-Israeli nationality in replying to a question Thursday during a two-hour interview on the France 2 television channel. Nearly an hour into the interview, the French-Lebanese journalist Lea Salame asked Le Pen to “clarify” certain aspects of her plan to outlaw dual nationality in France for French citizens who are also nationals of non-European countries. Asked whether this applied to Russia, which is in Europe but is not a member of the European Union, Le Pen said: “You know very well I want a Europe of nations and Russia belongs to it,” Le Pen said. Le Pen then was asked whether her plan was to make it impossible for Moroccans and Americans to have dual passports, while allowing it for Russians. “Yes, that’s what it’s like in Germany,” Le Pen responded. Since its establishment by Jean-Marie Le Pen, Le Pen’s father and the owner of multiple convictions for Holocaust denial and incitement to hatred against Jews, National Front has been accused of espousing anti-Semitism, hatred of Muslims and other forms of xenophobia. Many countries, including the Netherlands and other EU member states, have laws forbidding their citizens from assuming a second citizenship or requiring them to relinquish any foreign nationality.